In the irony of ironies, the central bank of Switzerland recently bailed out the manufacturer of the polymer material used in the new Swiss 10-franc notes. Swiss National Bank purchased a 90% stake in Landqart AG after the company got into financial difficulties. The SNB is known for its huge investments in equities, with Apple, Google, Microsoft and Amazon being it’s favorites. Its current holding are valued just short of $90 billion. Think of it. The Swiss National Bank, which creates money out of “thin air,” has purchased billions of dollars worth of stocks. And, it is not alone. 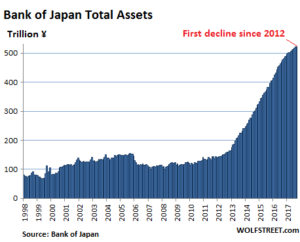 The Bank of Japan is a major shareholder in many Japanese companies. The European Central Bank also has purchased equities. Any wonder that stock indexes are hitting new highs on a regular basis? Central banks buying equities is not something that you will learn about while watching financial news programs, such as Varney and Company. They like to attribute higher stock prices solely to the recent tax cut. That central banks have created billions of dollar-equivalents and bought stocks is not discussed. What will happen to stock prices when central banks quit buying? And, you have to ask: what will happen when central banks decide to roll out of over-valued stocks and buy under-valued assets, such as gold? Or, they may just hold their stocks (after all, they have no cost in them) and simply buy gold. After all, gold — not stocks — is the classic central bank asset.